This page was created in loving memory of those who lived and died there, of those who ventured out, and all who left a legacy for future generations. This page is sponsored by JewishGen (the website for Jewish Genealogy). On this site you will see genealogical information that was collected about the town of Rymanow. We welcome your additions, comments and questions. Rymanow today is in southern Poland but was in Galicia, an Imperial Province (Kronland) of Austria-Hungary from 1776 to 1919 (see the map of Galicia on the left). After World War I Galicia was returned to a re-created Poland. I hope you will find all this interesting and helpful. Please contact me if you have information to add or any questions. As with any genealogical research, this is an evolving project. This site exists because of your Jewish Gen-erosity. Your tax deductible donation to JewishGen makes these services possible. We spent a great deal of time organizing this information so that your genealogical search might be more rewarding....and you can reward us -- just click on Jewish Gen-erosity. A History of Rymanow ...material gathered by our Researcher and Photographs from Debbie Raff. New 2008 photographs are in the 2008 travelogue below! The Old Shtetl: Rymanow by Schmuel Ben Eliezer, The Jewish Press, August 4th, 2006, with the permission of the author. Rymanow - The History of a Jewish Town - by Yeremy Mundek Weinreh. Sefer Rymanov, the Yizkor Book: parts are available on JewishGen! Find Other Researchers looking for your Surnames & Towns!! . Do you have roots in Rymanow? Would you like to connect with others researching the same community? Click here to search the JewishGen Family Finder database (JGFF). You may need to register, but i promise you, it's painless, and by registering, others will find you…so it’s worth the few minutes!! Yizkor Book online at JewishGen! Thanks to Yad Vashem the list of names from Sefer Rymanow is available! Please note: This site exists because of your Generosity. Your tax deductible donation to JewishGen makes these services possible. If this site helps your search, just click on Jewish Gen-erosity. Our researcher in Poland has gathered quite a number of interesting observations about the neighboring town of Rymanow. The Photographs were contributed by Deb Raff, who spent a recent summer in the area and Michal Lorenc, who is working to restore the cemetery. 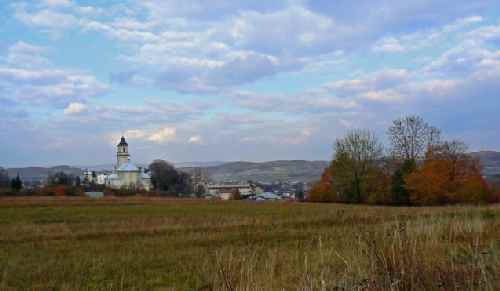 History: The Jewish settlement in Rymanów is very old and important, but not very well-documented. A synagogue already existed in the 16th Century. In those times, the Jews of Rymanów traded wine imported from Hungary, and sold it among others at the fairs in Krosno. In 1765, approximately 1015 Jews lived in Rymanów (42.8% of the population). In the 19th Century, Rymanów became one of the most important centers of theology and science in Galicia, thanks to the famous Zaddik, Menachem Mendel (Mendele of Rymanów, died in 1815) who was the pupil of Elimelech of Lezajsk and Szmelke of Nikolsburg, and the teacher of Naftali of Ropszyce. At the end of the 19th Century, the Zionist movement became active in Rymanów. In 1921, 1412 Jews lived in Rymanów (40% of the population). Shortly after the Nazis occupied Rymanów in 1939, a part of the Jews were driven off to the zone occupied by the Soviets. In 1942 men between 14 and 25 years old were taken to the labor camp of Plaszów. The remaining Jews were deported to the extermination camp in Belzec. The Synagogue is at the corner of Bieleckiego Street. Built in the 17th Century. Today it is in ruins. (editors note: not so, rad on to see the rebuilding of the synagogue). In the interior 4 columns and remains of frescoes have been preserved. The Cemetery is on Slowackiego Street, 500 m. from the Market Place. The year of foundation is unknown. Size 2.64 hectares, surrounded by a whitehorn hedge. Approximately 200 gravestones have been preserved, of which approximately 100 in a good state. Recently, two new ohels were built on top of the hill in the cemetery: one in memory of the murdered Jews, the other in memory of the Zaddiks of Rymanów. Mr. Bialas (Grundwaldzka Street), who takes care of the cemetery, has keys to the monuments. I z b a p a m i e c i (Memory Hall) , Bieleckiego Street 3. A collection of Jewish keepsakes. The railway station is located in the village of Wróblik (wonderful old wooden Greek-Orthodox church) - 5 km from the center of Rymanów (carriage 3 K., seat in cab 40 h.). (...) The townlet has 3800 inhabitants (1800 Jews) and is located on a hill. Hotel and restaurant of Marceli Nadziakiewicz (rooms from 2.40 to 3.40 K.). The only remarkable thing in Rymanów is the baroque Church from 1780 with its high tower, founded by the Ossolinski family. In the chapel a monument in red marble and alabaster for castellan Jan Sieminski (died 1580) and his wife. Beside this, Rymanów is known for its miracle-working rabbi and thus the crowds of Galician and Hungarian Jews, and for its unpredictable southern storms ...These gusts of wind -- the so-called Rymanower winds -- are so strong that they overturn people and carriages. First mention of and settlement in Rymanów is 1372-1378; located on the former trade route to Hungary. The local Jewish community belonged to the Kahal of Lesko. In the beginning of the 17th Century, the bishop of Przemysl convicted the Rymanów Jews of having profaned the Christian world. 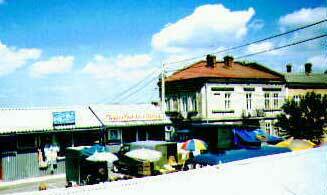 In the beginning of the 19th Century, the town became a center of Chassidism. Their seat in Rymanów had Menachem Mendel, pupil of Elimelech of Lezajsk, and after his death in 1815 his pupil, Cwi Hirsz Kohen (died 1846). The first synagogue was mentioned as early as 1593 . In the same time period, the first cemetery was created. The photographs were donated by Deb Raff; they were taken on a recent trip to the area. 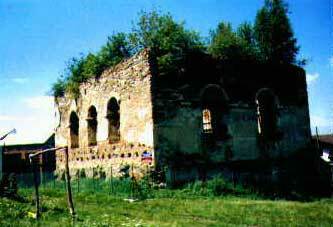 The synagogue at Bieleckiego Street was built at the end of the 18th C. Although made of stone and brick, it has steadily become dilapidated since the end of World War II.. It is located in the town's center, off the market place, on the slope of a hill. Only the walls of the main room with its square ground plan of 13.5 x 15 meters, the small round tower on the northwest corner and a part of the hall on the west side have been preserved. Inside, in the center of the main room, four beautifully ornamented brick columns with Corinthian capitals, spanned by a flattened cupola with fragments of the vault. In the interior walls a row of arched niches beneath the windows; the niche for the Aron ha-kodesh has been preserved as well as frescoes from the 20th C. The original shape of the roof is unknown. 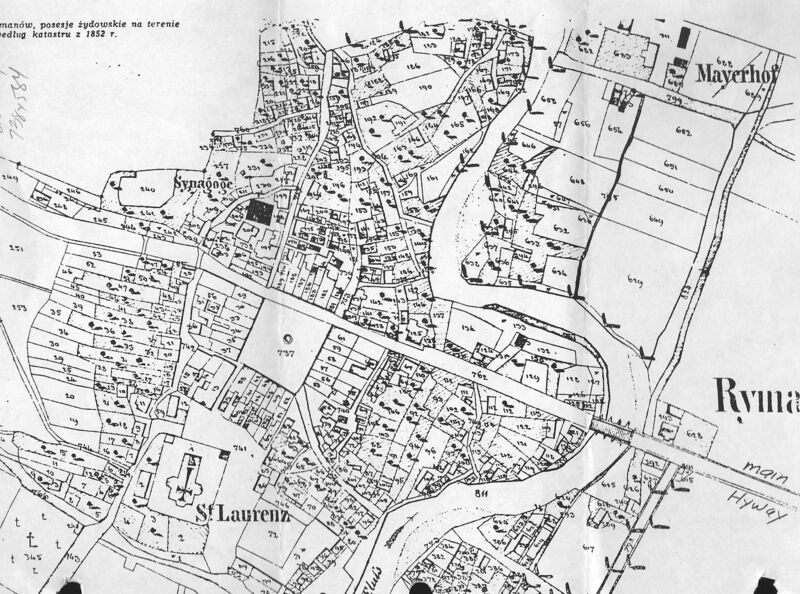 In August, 1942, the ghetto was established. The majority of the imprisoned Jews were deported to the extermination camp of Belzec, others were murdered in the ghetto and in the woods of Barwinek. The 1929 Business Directories for all the towns in galicia are available for viewing on JewishGen. If you wish to view the directory, click here and key in the name of your town. 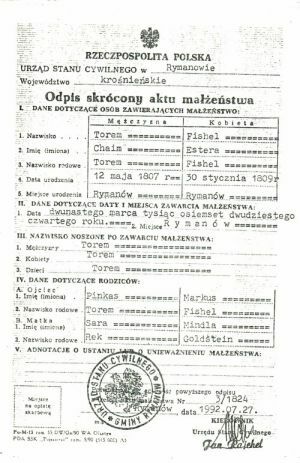 Notary Records 1928-1933 can be found in the Przemysl Archives. Land Registers 1785-8 & 1819-20 in Lvov. In February of 2018 i received this email: with these abstracts of vital records from the early 1800s! These abstracts were gotton in 1992 by mail from the USC in Rymanow. We're not sure, but perhaps the Jewish records were mixed in with others? The first is a birth record registered in 1807 for Chaim Torem, son of Pinkas Torem and Sara Rek. The second is a marriage record registered in 1824 for Chaim Torem and Estera Fishel (daughter of Markus Fishel and Mindla Goldstein). Once the immigrants arrived in the United States, they often banded together for mutual assistance purposes. It was also quite typical of the Landsmenshaften to own common cemetery plots. The Rymanower Young Mens Benevolent Society owned two Landsmanshaft plots in the New York City area. They are listed on the New York Jewish Genealogical website. The plots are located at Mt. Hebron (path 32, gate 2) and Mt. Zion (Block 75, path 1). I do not believe that this society is still in existence. But, if you have any information about the society or a cemetery plot, please contact Phyllis Kramer. We received this message in October of 2004 from Jonathan Boyarin, and we pass it along to you. "I saw your page about Rymanow on the JewishGen website, and thought you'd like to know that our synagogue, the Stanton Street Shul, has a historical connection to the Bluzhower-Rymanow society, which may be a succesor to the Rymanow landsmanshaft you refer to on the website. Although the congregation is officially known as Congregation Anschei Brzezan, the Bluzhower-Rymanow society paid "rent" for decades to join in the services, and that relationship was never terminated, though at most one or two members of that society are still at the shul. I believe as well that one of our elder congregants either was born in Rymanow himself, or has parents from Rymanow. 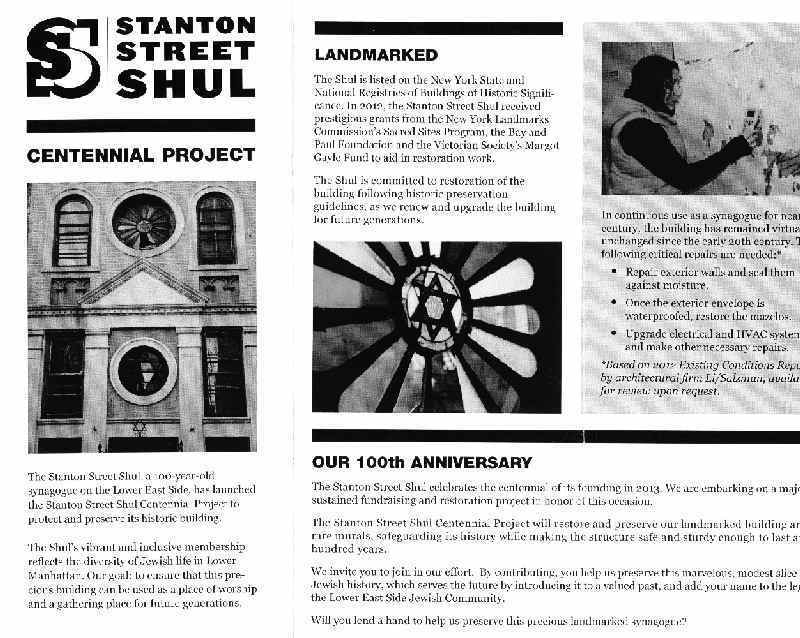 You can learn more about the shul at our website: www.stantonstreetshul.com, and are of course invited to visit us if you are ever in New York. " 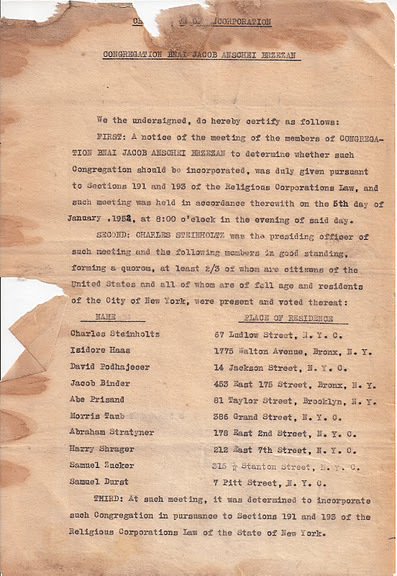 Subsequently we received this note from Barbara Cohen Pollak: "My son recently became the Rabbi of the Stanton Street Shul on the Lower East Side. Talking to the 90-year-old president, Bernie Sauerhaft, revealed that Rymanower YMB had merged at some point, along with several other Galician landsmanschaft, into Stanton Street Shul. The Hanging beside the Ner Tamid is also one from the shul in Rynanow." In 2011 after contacting Rabbi Josh Yuta, I was linked to the resident historical expert, Elissa Sampson; who led me to a collection of documents and photographs (http:> https://picasaweb.google.com/ejswoo/StantonStreetShulHistoricDocuments#541598227279662). Elissa was kind enough to allow me to use some of those documents and photographs pertinent to the Shul and Rymanow. This is a great example of constructive partnership of JewishGen's Kehilalinks and a local on-the-ground Shul with Rymanow connections. It gives international publicity to this wonderful community while at the same time, affording a information for folks researching their Rymanow roots. 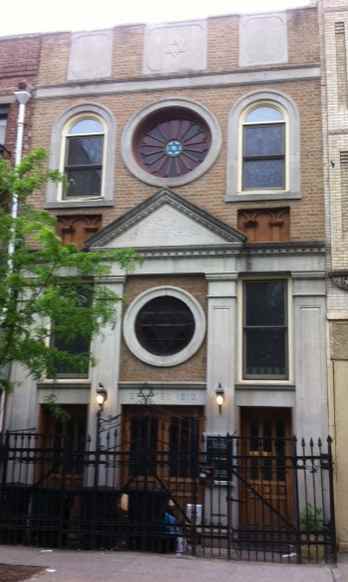 Located at 180 Stanton Street, this Shul has quite a history. It began with Congregation Bnai Jacob Anshe Brzezan (“Sons of Jacob, People of Brzezan”), a shtetl in Southeast Galicia (now the Ukraine). In 1952 the congregation merged with the joint congregation Bnai Joseph Dugel Macheneh Ephraim; DME, as it was known, represented the shtetls Rymanow and Blazowa in southwest Galicia. Today these two shtetls are in Poland. The Stanton Street Shul is one of only a few early synagogues that have survived; a veritable landmark of the Lower East Side. More history and information about this shul is on their web site http://www.stantonstshul.com/ and they are very welcoming to visitors! For Rymanow, there is a wonderful treat; one of the original Torahs from Rymanow is at the Stanton Street Shul today. 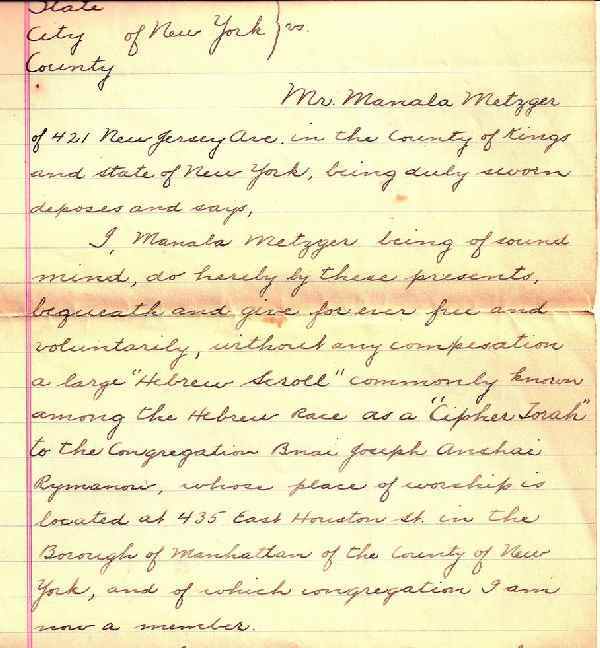 At the right is a notarized 1915 letter that shows a donation of a Sefer Torah (a Torah scroll) by Mrs. Manala Metzger to the Riminver congregation, Bnai Joseph Anshei Rymanow at 435 East Houston Street, NY. In In 1952 the joint congregation Bnai Joseph Dugel Macheneh Ephraim merged with the Congregation Anschei Brzezan. In 1965 David Weissman was President and Abraham Geller was Treasurer. 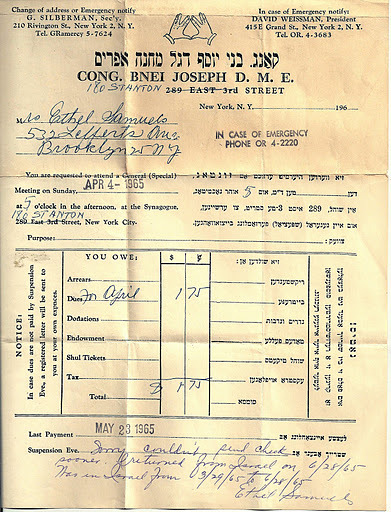 The 1965 dues statement of $1.75 for Esther Samuels of 532 Lefferts Blvd in Brooklyn, shows that Congregation Bnai Joseph D.M.E. moved from 289 East 3rd, to 180 Stanton Street, where they merged with Bnai Joseph Anshei Brezan. 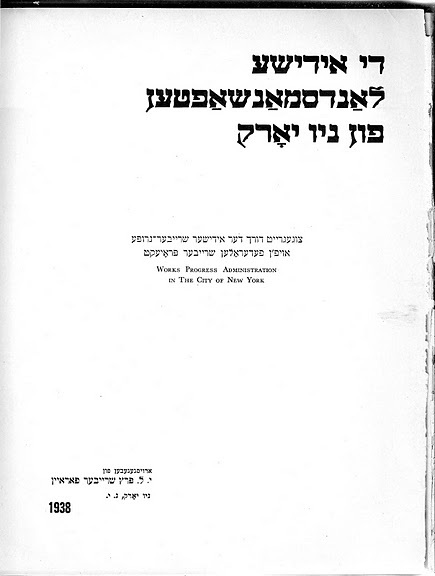 Some of this information came from the Landsmanshaften of New York, a work produced by the WPA in 1938.
Credit to the Stanton Street Shul, for these wonderful documents and photographs above. My great grandfather Albert LAUTMANN was born in Rymanow in 1827. His parents ,were Israel and Esther Lautmann. The photograph at the right show Albert (1829-1902) and his wife Cypresse Ortner (1832-1917), who was born also in Galicia. Unfortunatly I don't anything about his life in Rymanow. My great-aunt Pesia SINGER lived in Rymanow, Poland before WW2 and took care of my mother when she (as a young child) spent her summers there. 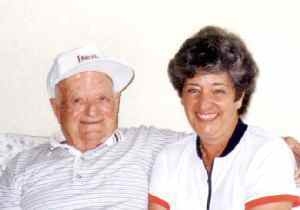 My grandfather Leon, Pesia's brother, had died of peritonitis shortly before my mother was born. My mother told me that Pesia lost her son and husband when they were executed by the Nazis, but survived the war and subsequently moved to America, however she knew no other details, and I have been unable to track Pesia or any surviving family. Some months ago, I was contacted by Malka Shacham Doron, whose mother Frida Stary knew Pesia when they were young, and had met Pesia in Israel after the Six Day War. Malka extracted details from her mother's diary and sent me the following information: Pesia Singer married Shmuel SHTOFF (from Sieniawa, Poland). They had two children - a girl named Lucia born 1929 and a boy named Ideck (Yehuda) who was born later. 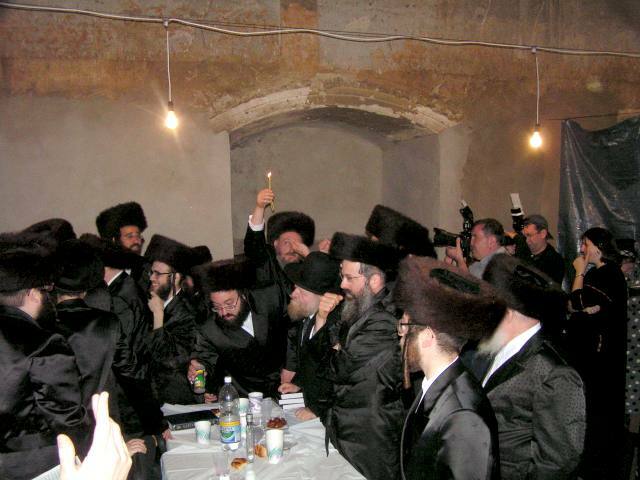 Shmuel became the chairman of the kehilla in Rymanow. After the Germans occupied Rymanow, Shmuel was asked by the Germans to give them a list of young men from Rymanow to do physical labour. He refused and was taken to the school yard at Bieletzky street (near Bielecki's house) together with his son Ideck. Shmuel wrapped both his son and himself with a tallit and both were shot to death. (March 1941). The perforated tallit still exists and is kept in (Ignacy) Bielecki's Judaica collection in Rymanow. Pesia buried some of her jewelry in the garden and took Lucia from home and fled that night from Rymanow. She hid Lucia at the home of their Christian maid in a small village near Krakow. Pesia turned a beggar, and for almost three years she sat next to Kosciol Mariacki (St. Mary's Basilica) in Krakow, where a priest allowed her to sleep inside the church at night. Towards the end of the war as the Russians were nearing, a Polish man from Rymanow who came to Sunday mass at the church recognized her. She immediately fled Krakow and went to the village where Lucia was and fetched her. During the last battles between the Russians and the Germans she arrived at Rymanow. She dug up the jewelry she had hidden and later settled in Sanok. Pesia was one of the first survivors and hosted many Jews from Rymanow that arrived later from various concentration camps. Later, Pesia immigrated to Canada with Lucia. A harrowing story, which I felt I must share - Pesia was both brave and lucky. It gives me hope that 1) I might be able to track Pesia in Canada (where I live! ); 2) Lucia might still be alive and 3) that some of those who survived the camps and visited Pesia in Sanok might have passed on some memories. I wonder if any 'Genners' might have some information. David Scriven. Meet Meier Kornreich, born in Rymanow in 1910; his parents were Josef KORNREICH and Malka STECHER. 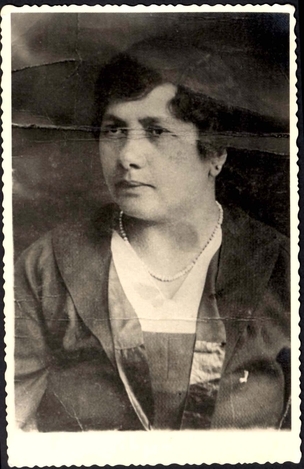 Malka, who was my grandmother's sister, was born in the nearby town of Zmigrod (to view the KehilaLinks site for Zmigrod, click here) to Leib STECHER and Golda TRACHMAN. Tragically Malka died young, after having 6 children: Schmiel (Sam), Moshe (Morris), Zlater, Zvi and Golda. Max told me many stories about his youth in Rymanow and some I'd like to relay. At 7 I left the house, bummed a ride to Zmigrod; went to live with my grandfather Lieb [STECHER]; I remember Lieb sent me into Zmigrod to the slaughter house with many chickens, but I didn’t know where it was. Leib's grandchildren were older; I remember [my aunt] Scheindel who was very kind [the tree is below]; After a few weeks went to live with the Blanks (they had pretty daughters) in Dembovitz near Jaslo [Zelda STECHER married Aaron BLANK]; they treated me well, but she had her own children. They took me to Jaslo and gave me a ticket to Rymanow. At 14 years old I went by train to Germany (Frankfort an Maim- a beautiful city) to join my brother Schmiel who was running a religious school; only had the address written down. But I didnt like religious school (we studied the bible), and only went because they gave me breakfast. At 15 years I left to Antwerp Belgium, with no money. Slept on floor of a friends house; they offered me a job with no wages, and sleeping in kitchen. I got rheumatism from that stone floor in the garage. My sister wrote suggesting I go to Vernich which has famous baths for your rheumatism. Returned to Belgium. Wanted to learn trade; in belgium law says must pay workers. I was 20/21, and i met and married Clara Lieber; I knew her mother and family well. I was always fond of swimming; I came to Daytona 15 years ago because I heard of the 36 mile beach. I've been here ever since." The photograph of Max and I was taken in 1997. Virtually all of the Feit families who immigrated to the United States since the mid-1880s from Austria /Poland are Jewish and originated from about 73 villages and towns in the southeastern corner of Poland. Most of these villages are clustered around Brzozów, Sanok, and Krosno and extend northward for about 60 miles along the River San – including Przemysl (near the border with Ukraine), Lezajsk, Rudnik, Nisko, Tarnobrzeg, Rozwadów and Radomysl – to where it meets the River Wisla at the former northern border of the Austrian province of Galicia. Other Feits branches stem from Rymanow and Jasienica Rosielna. Galician Jews adopted fixed hereditary surnames after the 1787 law of Kaiser Joseph II. Based on data extracted from hundreds of documents and databases, marriage and death certificates, naturalization records and information from Feit descendants, I have been creating family trees and searching for common ancestors to link together as many branches as possible. With a focus on older generations, my file now contains more than 8,000 individuals, with many name duplications, in 380 unconnected branches. The earliest known birth date is 1800 (Jacob Feit) and more than 1,500 individuals have known or estimated birth dates before 1900. Additional clues from descendants and Polish records are needed to merge more branches. The tree of the Feit brothers Isidore and Jacob from Krosno, Rymanów, Trzesniów and Brzozów contains 399 individuals. Two FEIT FamilyTree Project reports are available upon request. The database contains more than 1,200 different surnames. A FEIT Family Photo Album was also created. Click on the Gold Query. Click on "sounds like" . Below is the 1852 Rymanow directory....with house numbers!! I have been waiting for many years to match this list with a map of the town. And in 2017 i finally got the cadastral map from the same period, so now we can associate the house numbers with the occupants below. This was translated as: The Galician Crownland. An alphabetical index of the municipality of Rymanow, in the Dukla District, tax department of Rymanow from 1852; Geometer(?) Class IV of Joseph Kaner. Created/sponsored/composed? by the Associate second class Wenzel Arbiter. F1#-- Haus#-- Name-- Baup # --Grundp #--Sect. 158 250 Mordko Israel 32 . Below is the cadastral map of 1852. Note the sub title on the upper left portion of the map reads: "Rymanow, posesje zydowskie na terenie wedlug katastru z 1852", this translates to "Rymanov, Jewish property on the territory of the 1852 cadastre". It is quite large, so that you can match the names with the numbered plots above. You can see that the Jewish property is often around the synagogue. Not sure where the Rynec is, that might be also an area for Jewish Stores. Can anyone help?? Note the River Tabor running through the town. Estern, Bercer	1939 business list	Kolonialwarenhandlung	??? Gatzler, Hera	1939 business list	Galanteriewarenladen	??? Rottenberg, Sara	1939 business list	Galanteriewarenladen	??? Spira, Rachela	1939 business list	Gemischtwarenladen + Uhrmacherwerkstat	groceries + ??? Zitronenbaum, Chawa	1939 business list	Posamentenladen	??? This is the unalphabetized list...but it shows the location; You can use edit/find if you wish to search for a particular suname. At Szkolna Street Jacob Tuchman's vodka wholesale was located, and at Kolejowa Street there were the Józef Halpern's beer botteling and the Bercer Estern's colonial shop. While googling the internet for Rymanow, a friend came across the weekly lists of 1893 cholera epidemic victims; the lists indicates their towns, names, ages, occupations, the date when they contracted cholera, and date of death. The death date was left blank, unless the person succumbed to cholera. This is only a small sample of 6 weeks; there were many more pages on google, but unfortunately they are no longer available. In 2016 FindMyPast.com added many items from the British Archives. The following resulted from a search using RYMANOW as the query point. The images connected with these items contain even more information. Go to http://search.findmypast.co.uk/search-world-records/britain-enemy-aliens-and-internees-first-and-second-world-wars and put Rymanow into the keyword search field. This KehilaLinks page was created Phyllis Kramer, V.P. of Education, JewishGen Inc; you are visitor: If you have any questions, comments or additions, please email me by clicking here.